The 2017 Hyundai Elantra Sport is now available in the US, and it has arrived with more power than ever before, as well as upgrades to the chassis, powertrain, and design. 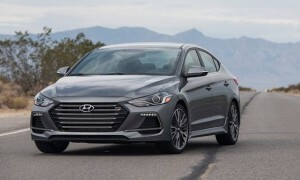 This is the most powerful Elantra ever produced, and it’s a model that is sure to turn heads with the changes made by Hyundai. At the heart of all this power is a 1.6 Turbo GDI four-cylinder engine that cranks out an impressive 200-hp and 190-lb.-ft. of torque. As far as the transmission goes, you have the choice between a 6-speed manual and a 7-speed DCT automatic. This model is more than just a great display of power, though, as it is also incredibly fun to drive, thanks in large part to the addition of an independent multi-link rear suspension that delivers improved feel and dynamics. There have also been upgrades made to the brakes, steering, and the spring and damper rates. The brakes in particular are important with this model offering more power and riding on 18-inch alloy wheels. On the inside, the 2017 Hyundai Elantra Sport features heated leather seats up front, each of which is more heavily bolstered than before. It also comes with a sporty D-shaped, leather-wrapped steering wheel, red contrast stitching, and a black headliner. While these are all considered upgrades, they have been chosen to complement the impressive list of standard features, which includes HID headlights, 7-inch display with Apple CarPlay and Android Auto, and a proximity key with push button start. When opting for the model with the standard 6-speed manual transmission, you are looking at a starting price of just $21,650. Opting for the 7-speed DCT and paddle shifters ups the price to $22,750, with both models subject to an $835 destination charge. The Premium Package can be added for $2,400, and comes with a 5-speaker sound system featuring Clari-Fi Music restoration technology, 8-inch navigation system, power sunroof, Blue Link connectivity, dual automatic temperature control and defogger, Blind Spot Detection with Rear Cross-traffic Alert & Lane Change Assist, and an auto-dimming rearview mirror with HomeLink and a compass. If you have been waiting for an Elantra model that adds a real boost of power and performance to your daily drive, then look no further than the 2017 model. The list of standard features beats just about everything else in the category, and all at a price that makes the Elantra Sport an incredible value proposition. This is an addition to the Elantra family that is sure to be a hit with those who want something more from their compact sedan. 1. When will Hyundai release the Sport edition? The Elantra Sport is already on sale at your local dealerships! 2. What are the available color options on the Elantra Sport? There are 6 eye-catching Elantra Sport colors available. The comes in red, white, blue, black, silver and gray paint hues. 3. Is it available in yellow paint? Theri is a yellow Elantra Sport available in South Korea, but not in the United States. There is a possibility that some new exterior color choices, including yellow (as seen at the picture above), could be introduced later this year, when Hyundai launches the 2018 Elantra Sport in US.